There’s a website (and Twitter feed) that I like to follow called Ghosts of DC. It posts articles and pictures of Washington, DC as it was decades ago, from the wood etchings era of the early 1800s to the dawn of photography a few decades later to color photography in the 1950s. It’s fascinating to see what the city was like and how unlike it was from how it is now. For instance, there’s this fascinating 1863 panorama, taken from the Capitol dome, that shows a canal through Washington where the National Mall is today. There’s a picture that Ghosts of DC occasionally posts of the unfinished Capitol in the distance, with an impressive gothic dual steepled church in the foreground. (Taken in 1862, it can be found on the Library of Congress website here.) I’m not at all religious, but I love pictures of churches and I love taking pictures of churches; there’s something about sacred architecture that speaks of humanity’s better nature. Suffice it to say, I was rather curious about the church, and soon I learned its name was Trinity Episcopal. I then learned that it stood at (variously given) 3rd and Indiana or 3rd and C, and a perusal of Google Maps, especially the satellite view, showed that it stood there no longer. Google was not entirely helpful to me, as there are other Trinity Episcopal Chruches in the Washington area, and most searches would either point me to those or back to the photo I had already seen or others I had not in various Library of Congress collections (such as this striking image) or other historical websites. But I was determined to find out about this church; surely, someone, somewhere on the Internet had the story. Then, quite by chance, I found a Washington Post article from last year — James Renwick’s Trinity Episcopal Church was a striking place of worship. The article went into the history of the church. It was designed by James Renwick, the architect who designed the Smithsonian castle, from a rejected design for the Smithsonian Castle. It was built in 1850, served as a Civil War hospital in the 1860s, its congregation dwindled and the building upkeep became too much, and was razed in the 1930s for a parking lot. In short, it answered pretty much every question I had. My quest for knowledge had not be an empty one. That’s how “progress” goes. Buildings outlive their usefulness, the public has different needs from when something was originally built. Sadly, even a striking red sandstone church isn’t immune. 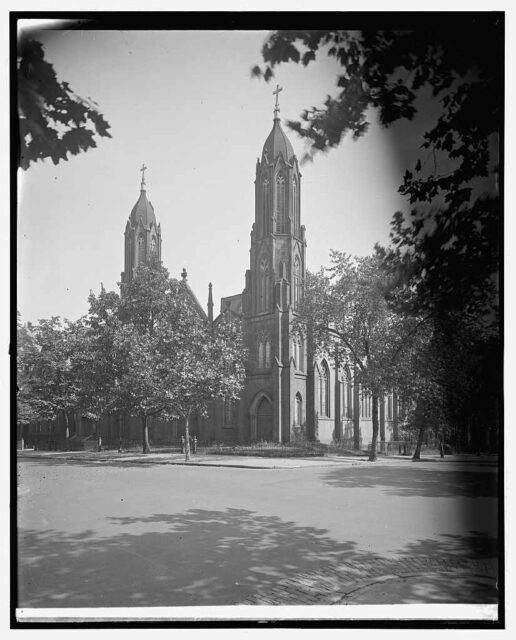 Now I know the story behind the church that has intrigued me in old photographs. Thank you for this! I had just come across that photo of the Capitol dome under construction and wondered where that beautiful church had gone. To learn it became a parking lot is so sad. You’re welcome! From the moment I saw the photo of Trinity in the foreground and the unfinished Capitol in the background, I just had to know more, and as I’ve uncovered more (like Renwick’s original design) over the last four years I’ve added new links. I’m glad my little bit of research helped.